Knob and tube wiring (sometimes abbreviated K&T) was an early standardized method of electrical wiring in buildings commonly used from about 1880 to the 1930’s. You can see it often in older homes and not with modern wiring. It consisted of single-insulated copper conductors run within walls or ceiling cavities, passing through joist and stud drill-holes via protective porcelain insulating tubes, and supported along their length on nailed-down porcelain knob insulators. Where conductors entered a wiring device such as a lamp or switch, or were pulled into a wall, they were protected by flexible cloth insulating sleeves called loom. The first insulation was asphalt-saturated cotton cloth, then rubber became common. Wire splices in such installations were twisted together for good mechanical strength, then soldered and wrapped with rubber insulating tape and friction tape (asphalt saturated cloth), or made inside metal junction boxes. Knob and tube wiring is an older system that part of the original installation of the house and was eventually displaced from interior wiring systems because of the high cost of installation compared with use of power cables, which combined both power conductors of a circuit in one run (and which later included grounding conductors). The Myth of K&T is Bad! I’ve been working on homes with knob and tube wiring for over 15 years. What I have noticed is that none of the connections which were original have come loose and/or started a fire as this is sometimes considered a fire hazard. The installations have remained free from problems from the day they were installed. K&T installations are a far superior installation than today’s common use of NM cable. The flip side to the efficiency of K&T vs NM cable is the extra (ground) wire provided within NM cable (which is labeled as NM-B; B for bare copper wire). Nevertheless, the benefits far outweigh replacing the K&T with NM cable. Wire nuts are what are used nowadays to make splices. It is common for these devices to come loose with high current stress on them if they were not properly installed. The torque to install these devices are high; and, although five or six connections are not a big deal—imagine 500 in a day! New houses are pumped out for the lowest and quickest bid that can be offered; this is a major reason why electrical contractors have to come back and fix something. With K&T, you had the mechanical connection to make and then solder it. The mechanical connection is performed by twisting the wires together, similar to the wire nut; and, soldering it prevents the wires to come apart from expansion and contraction. 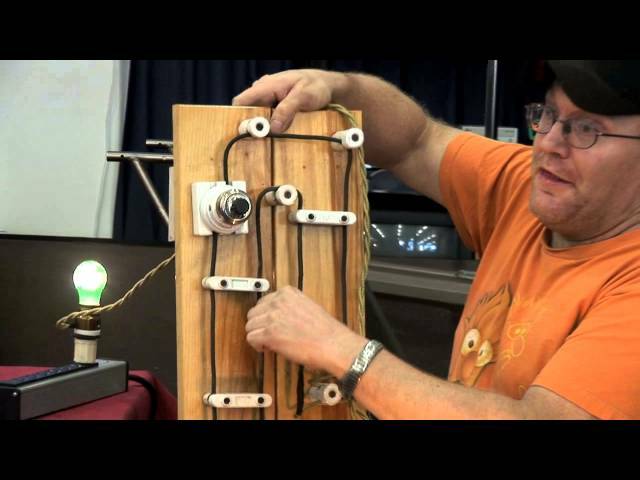 If you have knob & tube wiring in your home, don’t fret! Have one of our professionals evaluate your situation to see if there are any visible hazards. The primary concern we have is inexperienced individuals tapping into these systems. The system is perfect for what it was installed for and can provide your home with the majority of its needs; after all, it’s been there for over 80 years! Instead of replacing it, protect it with circuit breakers instead of fuses; that way, if ever the circuit is overloaded, you just flip the breaker. Now, why would it overload? Because in those days, we didn’t have a George Foreman Grill, a microwave hood, and juicer all in one outlet! What needs to happen is you should upgrade your wiring network by adding and not replacing! Additionally, K&T wiring are typically landed into fuse panels an/or Federal Pacific panels…which is another story! Read more here about Federal Pacific Panels. GFCI/Circuit for Knob & Tube Fed Receptacles? This is a subject which we have advised many of our customers on being well informed before spending their money inefficiently. Considering the majority of bedroom appliances are 2-prong cords, is it feasible to replace every receptacle with GFCI’s or installing a ground? The purpose of GFCI receptacles are to protect personnel from the hazards of electrocution when subject to water, copper lines, concrete and other metal grounding paths to earth that can pass through a human being if an appliance’s surface becomes energized. In a bedroom, the floor is typically wood and/or carpeted. Considering most bedroom appliances are 2-prong, there are no metal parts on the appliance that are likely to become energized. Having a GFCI receptacle would be inefficient in this case. On the other hand, if you have a computer and/or an expensive TV which requires a ground (3-prong cord), the grounding is primarily for the removal of harmonic currents and/or voltage transients. Instead of installing a GFCI receptacle (which is for personnel protection and not equipment protection), we would suggest installing a dedicated circuit for that piece of equipment. The reason we specified an expensive TV (and computer for that matter) is because you should weigh your options—if a computer/TV costs $250, would a $375 dedicated circuit installation be worth it? On the other hand, if the unit(s) cost well over $1000, I think the cost of installing a dedicated circuit would be a great investment. Please note, surge protectors are USELESS (besides being a power strip) if no ground is present. The presence of a GFCI does not signify you have a ground; it only trips in the event 6mA of current passes through the ground prong or a 6mA differential is realized in the neutral; which electronic equipment are known for. This electronic distortion (harmonics) have produced nuisance tripping frequently. Nevertheless, if you decide you would STILL like to replace all the receptacles with GFCI’s, we can most definitely accommodate your request. Another method of protecting your electronic equipment, in the event the cost is inefficient as aforementioned, a Whole House Surge Protector would be a better alternative. These devices are installed in your electrical panel to stop transient voltages from entering and ruining your electronic equipment. They are not the best option in some instances, but they are very effective. For more information, read our article on Whole House Surge Protectors or contact us so we can answer any questions or concerns pertaining to these devices. This is the primary reason we get called out to replace all the knob and tube in your home—uninsurable! Here are the facts, folks…replacing the system can cost you thousands! The cheapest way to replace your K&T would be to have all your walls torn down completely, and then rewiring your whole house. If not, you would incur a larger labor expense in order to fish wire through walls; an installation can cost $10,000 -20,000! Yes, that’s correct, you did not read a typo! It costs upwards of $10,000+ to replace and get you up to 2017 and beyond standards. AC Electric is not in the business of walking away from work if it is offered. What we like is to have its customers know and understand all the facts before making a purchase so you don’t have a “bad taste in your mouth” after we have serviced your request—we strive for the best customer service experience we can offer. If you ever have an issue with your insurance company and are unable to get your home insured due to K&T wiring, we suggest you calling either Thomas Unik Insurance or Bill Mason Agency (Parma and Euclid). They have been providing us business insurance since 1999, and have served customers like you since 1936! We highly recommend this agency for your home’s insurance requirements. We hope this article has made you more comfortable with your homes electrical system. If you are still worried and don’t want to see the K&T wiring running across your basement, we can install the majority of the wiring into junction boxes and run all wiring in conduit for a cleaner looking installation. We can also provide better lighting in addition to the installation. Call us with any questions or concerns and we will make you feel more at home…in your home! Here’s a brief video from YouTube that’s very helpful for this topic!